This article is about the Austrian economist. It is not to be confused with his brother, mathematician Richard von Mises, Ludwig Mies van der Rohe, or von Mises yield criterion. 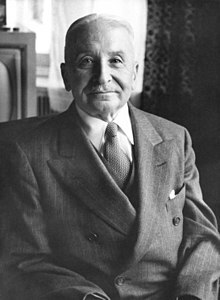 Ludwig Heinrich Edler von Mises (/ˈmiːziːz/;[better source needed] German: [ˈluːtvɪç fɔn ˈmiːzəs]; 29 September 1881 – 10 October 1973) was an Austrian School economist, historian, and sociologist. Mises wrote and lectured extensively on behalf of classical liberalism. He is best known for his work on praxeology, a study of human choice and action. Mises emigrated from Austria to the United States in 1940. Since the mid-20th century, the libertarian movement in the United States has been strongly influenced by Mises's writings. Mises's student Friedrich Hayek viewed Mises as one of the major figures in the revival of liberalism in the post-war era. Hayek's work "The Transmission of the Ideals of Freedom" (1951) pays high tribute to the influence of Mises in the 20th century libertarian movement. Mises's Private Seminar was a leading group of economists. Many of its alumni, including Hayek and Oskar Morgenstern, emigrated from Austria to the United States and Great Britain. Mises has been described as having approximately seventy close students in Austria. The Ludwig von Mises Institute was founded in the United States to continue his teachings. Ludwig von Mises was born to Jewish parents in the city of Lemberg, Galicia, Austria-Hungary (Ukrainian : Lviv, now Ukraine). The family of his father, Arthur Edler von Mises, had been elevated to the Austrian nobility in the 19th century (Edler indicates a noble landless family) and they had been involved in financing and constructing railroads. His mother Adele (née Landau) was a niece of Dr. Joachim Landau, a Liberal Party deputy to the Austrian Parliament. :3–9 Arthur von Mises was stationed in Lemberg as a construction engineer with the Czernowitz railway company. In 1900, Mises attended the University of Vienna, becoming influenced by the works of Carl Menger. Mises's father died in 1903. Three years later, Mises was awarded his doctorate from the school of law in 1906. Mises was chief economist for the Austrian Chamber of Commerce and was an economic adviser of Engelbert Dollfuss, the austrofascist but strongly anti-Nazi Austrian Chancellor. Later, Mises was economic adviser to Otto von Habsburg, the Christian democratic politician and claimant to the throne of Austria (which had been legally abolished in 1918 following the Great War). In 1934, Mises left Austria for Geneva, Switzerland, where he was a professor at the Graduate Institute of International Studies until 1940. While in Switzerland, Mises married Margit Herzfeld Serény, a former actress and widow of Ferdinand Serény. She was the mother of Gitta Sereny. In 1940, Mises and his wife fled the German advance in Europe and emigrated to New York City in the United States. :xi He had come to the United States under a grant by the Rockefeller Foundation. Like many other classical liberal scholars who fled to the United States, he received support by the William Volker Fund to obtain a position in American universities. Mises became a visiting professor at New York University and held this position from 1945 until his retirement in 1969, though he was not salaried by the university. Businessman and libertarian commentator Lawrence Fertig, a member of the New York University Board of Trustees, funded Mises and his work. For part of this period, Mises studied currency issues for the Pan-Europa movement, which was led by Richard von Coudenhove-Kalergi, a fellow New York University faculty member and Austrian exile. In 1947, Mises became one of the founding members of the Mont Pelerin Society. Mises retired from teaching at the age of 87 and died at the age of 92 in New York. He is buried at Ferncliff Cemetery in Hartsdale, New York. Grove City College houses the 20,000-page archive of Mises papers and unpublished works. The personal library of Mises was given to Hillsdale College as bequeathed in his will. At one time, Mises praised the work of writer Ayn Rand and she generally looked on his work with favor, but the two had a volatile relationship, with strong disagreements for example over the moral basis of capitalism. Mises wrote and lectured extensively on behalf of classical liberalism. In his magnum opus Human Action, Mises adopted praxeology as a general conceptual foundation of the social sciences and set forth his methodological approach to economics. Mises was for economic non-interventionism and was an anti-imperialist. He referred to the Great War as such a watershed event in human history and wrote that "war has become more fearful and destructive than ever before because it is now waged with all the means of the highly developed technique that the free economy has created. Bourgeois civilization has built railroads and electric power plants, has invented explosives and airplanes, in order to create wealth. Imperialism has placed the tools of peace in the service of destruction. With modern means it would be easy to wipe out humanity at one blow." In 1920, Mises introduced in an article his Economic Calculation Problem as a critique of socialisms which are based on planned economies and renunciations of the price mechanism. In his first article "Economic Calculation in the Socialist Commonwealth", Mises describes the nature of the price system under capitalism and describes how individual subjective values are translated into the objective information necessary for rational allocation of resources in society. Mises argued that the pricing systems in socialist economies were necessarily deficient because if a public entity owned all the means of production, no rational prices could be obtained for capital goods as they were merely internal transfers of goods and not "objects of exchange", unlike final goods. Therefore, they were unpriced and hence the system would be necessarily irrational, as the central planners would not know how to allocate the available resources efficiently. He wrote that "rational economic activity is impossible in a socialist commonwealth". Mises developed his critique of socialism more completely in his 1922 book Socialism: An Economic and Sociological Analysis, arguing that the market price system is an expression of praxeology and can not be replicated by any form of bureaucracy. Friends and students of Mises in Europe included Wilhelm Röpke and Alfred Müller-Armack (advisors to German chancellor Ludwig Erhard), Jacques Rueff (monetary advisor to Charles de Gaulle), Gottfried Haberler (later a professor at Harvard), Lionel, Lord Robbins (of the London School of Economics), Italian President Luigi Einaudi and Leonid Hurwicz, recipient of the 2007 Nobel Memorial Prize in Economic Sciences. Economist and political theorist Friedrich Hayek first came to know Mises while working as his subordinate at a government office dealing with Austria's post-World War I debt. While toasting Mises at a party in 1956, Hayek said: "I came to know him as one of the best educated and informed men I have ever known". :219–20 Mises's seminars in Vienna fostered lively discussion among established economists there. The meetings were also visited by other important economists who happened to be traveling through Vienna. At his New York University seminar and at informal meetings at his apartment, Mises attracted college and high school students who had heard of his European reputation. They listened while he gave carefully prepared lectures from notes. Among those who attended his informal seminar over the course of two decades in New York were Israel Kirzner, Hans Sennholz, Ralph Raico, Leonard Liggio, George Reisman and Murray Rothbard. Mises's work also influenced other Americans, including Benjamin Anderson, Leonard Read, Henry Hazlitt, Max Eastman, legal scholar Sylvester J. Petro and novelist Ayn Rand. Economic historian Bruce Caldwell writes that in the mid-20th century, with the ascendance of positivism and Keynesianism, Mises came to be regarded by many as the "archetypal 'unscientific' economist". In a 1957 review of his book The Anti-Capitalistic Mentality, The Economist said of Mises: "Professor von Mises has a splendid analytical mind and an admirable passion for liberty; but as a student of human nature he is worse than null and as a debater he is of Hyde Park standard". Conservative commentator Whittaker Chambers published a similarly negative review of that book in the National Review, stating that Mises's thesis that anti-capitalist sentiment was rooted in "envy" epitomized "know-nothing conservatism" at its "know-nothingest". At first we all felt he was frightfully exaggerating and even offensive in tone. You see, he hurt all our deepest feelings, but gradually he won us around, although for a long time I had to – I just learned he was usually right in his conclusions, but I was not completely satisfied with his argument. The story I remember best happened at the initial Mont Pelerin meeting when he got up and said, "You're all a bunch of socialists." We were discussing the distribution of income, and whether you should have progressive income taxes. Some of the people there were expressing the view that there could be a justification for it. Another occasion which is equally telling: Fritz Machlup was a student of Mises's, one of his most faithful disciples. At one of the Mont Pelerin meetings, Machlup gave a talk in which I think he questioned the idea of a gold standard; he came out in favor of floating exchange rates. Mises was so mad he wouldn't speak to Machlup for three years. Some people had to come around and bring them together again. It's hard to understand; you can get some understanding of it by taking into account how people like Mises were persecuted in their lives. Economist Murray Rothbard, who studied under Mises, agreed he was uncompromising, but disputes reports of his abrasiveness. In his words, Mises was "unbelievably sweet, constantly finding research projects for students to do, unfailingly courteous, and never bitter" about the discrimination he received at the hands of the economic establishment of his time. Mises's 1927 book Liberalism has been largely ignored, except for its comments on fascism. Marxists Herbert Marcuse and Perry Anderson as well as German writer Claus-Dieter Krohn criticized Mises for writing approvingly of Italian fascism, especially for its suppression of leftist elements. In 2009, economist J. Bradford DeLong and sociologist Richard Seymour repeated the criticism. His most eminent qualities were his inflexible honesty, his unhesitating sincerity. He never yielded. He always freely enunciated what he considered to be true. If he had been prepared to suppress or only to soften his criticisms of popular, but irresponsible, policies, the most influential positions and offices would have been offered him. But he never compromised. ^ Also /ˈmiːsiːz/, /ˈmiːzɪz/, /ˈmiːsɪz/ (see "View Poll Results: How do you pronounce 'Mises'?"). ^ Hayek, Friedrich A. (2012). "The Transmission of the Ideals of Economic Freedom". Econ Journal Watch. 9 (2): 163–69. ^ Mises, Ludwig von (2013). Notes and Recollections. http://lf-oll.s3.amazonaws.com/titles/2603/Mises_Recollections_LFeBK.pdf: Liberty Fund. p. 69. ISBN 978-0-86597-853-9. ^ Beller, Steven (1989). Vienna and the Jews, 1867–1938: A Cultural History. Cambridge University Press. ^ a b c d Hülsmann, Jörg Guido (2007). Mises: The Last Knight of Liberalism. Ludwig von Mises Institute. ISBN 978-1-933550-18-3. ^ "Richard von Mises". Encyclopædia Britannica. Retrieved 8 August 2013. ^ Von Mises, Ludwig; Goddard, Arthur (1979). Liberalism: A Socio-Economic Exposition (2 ed.). ISBN 978-0-8362-5106-7. ^ a b "Biography of Ludwig von Mises (1881–1973) ('Chronology')". Mises.org. Retrieved 21 July 2013. ^ Mises, Ludwig von, The Historical Setting of the Austrian School of Economics, Arlington House, 1969, reprinted by the Ludwig von Mises Institute, 1984, p. 10, Rothbard, Murray, The Essential Ludwig von Mises, 2nd printing, Ludwig von Mises Institute, 1983, p. 30. ^ "The Free Market: Meaning of the Mises Papers, The". Mises.org. Retrieved 2009-11-26. ^ Kitch, Edmund W. (April 1983). "The Fire of Truth: A Remembrance of Law and Economics at Chicago, 1932–1970". Journal of Law and Economics. 26 (1): 163–234. doi:10.1086/467030. ^ Moss, Laurence S. "Introduction". The Economics of Ludwig von Mises: Toward a Critical Reappraisal. Sheed and Ward, 1976. ^ Coudenhove-Kalergi, Richard Nikolaus, Graf von (1953). An idea conquers the world. London: Hutchinson. p. 247. ^ Kurien Society of Science and Art website, Listing of recipients of the Austrian Decoration for Science and Art; Google Translated page, accessed June 5, 2013. ^ Rothbard, Murray, Ludwig von Mises: Scholar, Creator, Hero, the Ludwig von Mises Institute, 1988, p. 61. ^ Austrian Student Scholars Conference Announcement, Grove City College website, 2013, accessed June 8, 2013. ^ "About – Collections – Mossey Library". lib.hillsdale.edu. Retrieved 2016-07-26. ^ Jennifer Burns (2009). Goddess of the Market: Ayn Rand and the American Right. Oxford University Press. pp. 106, 141. ISBN 978-0199740895. ^ For example, Murray Rothbard, a leading Austrian school economist, has written that, by the 1920s, "Mises was clearly the outstanding bearer of the great Austrian tradition." Ludwig von Mises: Scholar, Creator, Hero, the Ludwig von Mises Institute, 1988, p. 25. ^ "Why Intervention Persists". 2005-03-16. ^ "The Anti-Imperialism of Mises". 2013-06-24. ^ "Ludwig von Mises on World War I | Ludwig von Mises". 2017-04-06. ^ a b c d Von Mises, Ludwig (1990). Economic calculation in the Socialist Commonwealth (pdf). Ludwig von Mises Institute. Retrieved 2008-09-08. ^ Rothbard, Murray, Ludwig von Mises: Scholar, Creator, Hero, the Ludwig von Mises Institute, 1988, p. 67. ^ Vaughn, Karen I (1998). Austrian Economics in America. Cambridge University Press. ISBN 978-0521637657. pp. 66–67. ^ Reisman, George, Capitalism: a Treatise on Economics, "Introduction," Jameson Books, 1996; and Mises, Margit von, My Years with Ludwig von Mises, 2nd enlarged edit., Center for Future Education, 1984, pp. 136–37. ^ On Mises's influence, see Rothbard, Murray, The Essential Ludwig von Mises, 2nd printing, the Ludwig von Mises Institute, 1983; on Eastman's conversion "from Marx to Mises," see Diggins, John P., Up From Communism Harper & Row, 1975, pp. 201–33; on Mises's students and seminar attendees, see Mises, Margit von, My Years with Ludwig von Mises, Arlington House, 1976, 2nd enlarged edit., Center for Future Education, 1984. ^ Caldwell, Bruce (2004). Hayek's Challenge. The University of Chicago Press. pp. 125–26. ISBN 978-0-226-09191-4. ^ Quoted in Sam Tanenhaus, Whittaker Chambers: A Biography, (Random House, New York, 1997), p. 500. ISBN 978-0-375-75145-5. ^ "Best of Both Worlds (Interview with Milton Friedman)". Reason. June 1995. ^ Murray Rothbard, "The Future of Austrian Economics" on YouTube, 1990 talk at Mises University at Stanford, at MisesMedia Youtube channel. ^ Ludwig von Mises, "Liberalism", Chapter 10, The Argument of Fascism, 1927. ^ Kirzner, Israel M. (2001). Ludwig von Mises: The Man and his Economics. Wilmington, DE: ISI Books. p. 31. ISBN 978-1882926688. OCLC 47734733. Butler, Eamonn, Ludwig von Mises – A Primer, Institute of Economic Affairs (2010). Ebeling, Richard M. "Ludwig von Mises: The Political Economist of Liberty, Part I", (The Freeman, May 2006). Ebeling, Richard M. "Ludwig von Mises: The Political Economist of Liberty, Part II", (The Freeman, June 2006). Ebeling, Richard M. "Ludwig von Mises and the Vienna of His Time, Part I", (The Freeman, March 2005). Ebeling, Richard M. "Ludwig von Mises and the Vienna of His Time, Part II", (The Freeman, April 2005). Ebeling, Richard M. "Austrian Economics and the Political Economy of Freedom", (The Freeman, June 2004). Gordon, David (2011-02-23) Mises's Epistemology, Ludwig von Mises Institute. Shelton, Judy (1994). Money Meltdown: Restoring Order to the Global Currency System. New York: Free Press. p. 399. ISBN 978-0029291122. OCLC 797359731. Reviewed in: Dornbusch, Rudi (July 10, 1994). "Money Meltdown". The Washington Post. Archived from the original on March 29, 2015. Retrieved May 25, 2013. The hero in this book is Ludwig von Mises. (from HighBeam Research). von Mises, Margit (1976). My Years with Ludwig von Mises. Arlington House Publishers. ISBN 978-0-87000-368-4. Yeager, Leland (2008). "Mises, Ludwig von (1881–1972)". In Hamowy, Ronald (ed.). Mises, Ludwig von (1881–1973). The Encyclopedia of Libertarianism. Thousand Oaks, CA: Sage; Cato Institute. pp. 334–36. doi:10.4135/9781412965811.n205. ISBN 978-1412965804. LCCN 2008009151. OCLC 750831024.